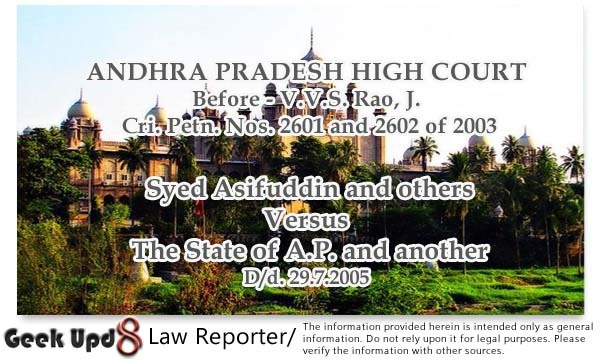 ANDHRA PRADESH HIGH COURT Before :- V.V.S. Rao, J. For the Petitioner :- Rama Rao Ghanta, Advocate. For the Respondent Nos. 1 and 2 :- Public Prosecutor and D. Deshadri Naidu. 1. State of West Bengal v. Swapan Kumar, AIR 1982 SC 949 : (1982 Cri LJ 819). 2. State of Haryana v. Bhajan Lal, AIR 1992 SC 604 : (1992 Cri LJ 527). 3. R. P. Kapoor v. State of Punjab, AIR 1960 SC 866 : (1960 Cri LJ 1239). 4. State of Tamil Nadu v. Thirukkural Permal, (1995) 2 SCC 449. V.V.S. Rao, J. - These two petitions are filed by different persons under Section 482 of Code of Criminal Procedure, 1973 (Cr. P. C.) seeking similar relief. Both the matters were admitted on the same day and since then both the matters are being listed together for being disposed of as such, this common order covers both the matters. The petitioners in both the matters seek the relief of quashing F. I. R. No. 20 of 2003 of Criminal Investigation Department (C. I. D.) Police, Hyderabad, registered under Sections 409, 420 and 120B of Indian Penal Code, 1860 (for short, IPC), Section 65 of the Information Technology Act, 2000 (for short, IT Act) and Section 63 of the Copyright Act, 1957 (for short, Copyright Act). 2. The crime was registered against the petitioners on a written complaint given by the Head of Sales and Marketing Wing of M/s. Reliance Infocomm Ltd., Hyderabad, the second respondent herein. In the complaint, it is alleged that certain vested elements of the trade of mobile telephone services began to woo the subscribers of Reliance India Mobile (RIM) into various other schemes promoted by other similar service providers, which would have the impact on the image as well as the revenues of the second respondent. Reliance Infocomm under Dhirubhai Ambani Pioneer Offer launched telephone services named as 'Reliance India Mobile' with a view to make communication affordable to the masses. The same was later modified and the scheme titled 'POBI', which is the most affordable in the market today. Under the said scheme, the subscriber gets a digital handset worth Rs. 10,500/- as well as service bundle for three years with an initial payment of Rs. 3,350/- and monthly outflow of meager Rs. 600/-. The subscriber also gets one year warranty and insurance for three years. The handset given to the subscriber is third generation digital handset with a host of features which are of first of its kind coupled with attractive tariff options. In view of this, the market response in twin cities has been phenomenal. This has an impact on the business of other service providers for the reason that those service providers attempted unethical and illegal practices for weaning away the subscribers of the second respondent. 3. In the complaint, the modus operandi adopted by other mobile service providers is described as follows : The subscribers of the second respondent are attracted by making phone calls impressing upon them that the tariff plans and services provided by others are better than the services of Reliance Infocomm and also advise them that they have an option to shift the service provider by paying an amount of Rs. 3,000/- towards plan charges and deposits if desired are only Rs. 540/- towards activation fee. Certain unknown persons in Abids, Begumpet, Koti, Himayatnagar and Malak-pet are making the calls to the subscribers of second respondent. Once the subscriber agrees that he can keep a world class handset which is proprietary to Reliance and also enjoy the best tariff plan of the competitor, he is asked to meet any of the business associates of rival service providers. At the rendezvous, the customer is asked to wait for an hour and an usher carries the handset to an undisclosed location in Secundera-bad for conversion process, which takes about 45 minutes to an hour and half. During this time, ESN number of Reliance instrument is hacked by reprogramming and the subscriber is given the handset and instructed to switch off and switch on the handset later in the day and start enjoying the new services. The investigation made so far revealed that the Reliance Infocomm is offering under Dhirubhai Ambani Pioneer Scheme a third generation digital handset costing about Rs. 10,500/- for a mere payment of Rs. 3,350/- with a condition to sail with their network for a period of 3 years with option to exit either by surrendering the handset or paying the cost of the handset to the company. Investigation also reveals that there is an agreement existing between the Samsung manufacturers and LG manufacturers with Reliance Infocomm regarding their exclusive models Samsung N191 and LG-2030. These model handsets are to be exclusively used by Reliance India Mobile Limited only. In contravention to the above contract the TATA Indicom staff members who are figured as an accused are tampering with pre-programmed CDMA digital handsets belonging to Reliance Infocomm and activating with their network with all dubious means which is an offence under Section 65, I. T. Act. Secondly, the customer is not barred from exiting from the Reliance network as such and to quit from that network he has to fulfil the obligations laid down in the terms and conditions of the Reliance company. Till the lock in period of 3 years is over, the handset supplied to the customer by Reliance Infocomm is a joint property of the company and any kind of transaction on the part of the subscriber without fulfilling the obligations laid down in the terms and conditions is clear case of Breach of Trust since the customer has not settled the accounts with the company. Further as the competition between the CDMA service providers blown out of proportions, the TATA Indicom has hatched a conspiracy to hijack the customers of Reliance Infocomm by all fraudulent means and as a part of their Infocomm by all fraudulent means and as a part of their conspiracy trying to woo the customers of Reliance Infocomm with different tariff packages and trying to trap gullible customers and succeeded in their attempt to attract their customers and so far as many as 63 customers belonging to Reliance Infocomm so far migrated to TATA Indicom by illegal means. 5. These two petitions came to be filed on 17-6-2003 for quashing crime No. 20 of 2003 by the means of TATA Indicom. While admitting the petitions, this Court passed orders in criminal miscellaneous petition No. 3951 of 2003 staying all further proceedings including investigation of the crime pending disposal of the main petition. The Public Prosecutor filed criminal miscellaneous petition No. 232 of 2005 for vacating the said order. The matters were finally heard at that stage itself and are being disposed of finally. 6. The petitioners in both the petitions are employees of Tata Tele Services Limited (TTSL) which provides basic telephone services including Wireless in Local Loop (WLL) services on non-exclusive basis in the service area including State of Andhra Pradesh under the name of Tata Indicom. All of them are alleged to have committed offences punishable under Sections 420, 409 and 120B of IPC, Section 65 of IT Act and Section 63 of Copyright Act. Learned Senior Counsel for the petitioner, Sri C. Padmanabha Reddy, submits that it is always open for the subscriber to change from one service provider to the other service provider and the subscriber who wants to change from Tata Indicom always takes his handset to BSNL or to Reliance to get service connected and to give up services of TTSL. According to the learned counsel, the CDMA handsets brought to TTSL by subscribers of other service providers are capable of accommodating two separate lines and can be activated on principal assignment mobile (NAM 1 or NAM 2). The mere activation of NAM 1 or NAM 2 by TTSL in relation to a handset brought to it by the subscriber of other service provider does not amount to any crime. According to learned counsel, an offence under Section 409 of IPC is not at all made out even by going through the FIR, as well as remand report. In the absence of dishonest appropriation or conversion to their own use, alleged criminal breach of trust by the petitioners does not arise. 7. The learned Senior Counsel also submits that there was no allegation against the petitioners that they deceived the second respondent fraudulently and dishonestly to deliver the property or to retain the property and therefore the offence of cheating under Section 420 of IPC does not arise. As Section 120B of IPC is relatable only to the offences under Sections 490 and 420 of IPC, the charge under Section 120B of IPC is misconceived. Insofar as the offence under Section 65 of IT Act is concerned, the submission of the learned Senior Counsel is as follows : A telephone handset is not a computer nor a computer system containing a computer programme. Alternatively, in the absence of any law which is in force requiring the maintenance of "computer source code", the allegation that the petitioners concealed, destroyed or altered any computer source code, is devoid of any substance and therefore the offence of hacking is absent. In the absence of any allegation by the second respondent that they have a copyright to the source code of the computer programme in the handsets supplied by second respondent, the infringement of copyright does not arise. He lastly submits that the allegation that TTSL has a subscriber base of 100 thousand (one lakh) customers in Andhra Pradesh and therefore there was no necessity for TTSL to woo the customers/subscribers of second respondent. 8. The learned Additional Public Prosecutor, Sri H. Prahlad Reddy and the learned counsel for the second respondent, Sri D. Seshadri Naidu, submit that when a cognizable offence under various provisions of different statutes is registered and investigation is pending, this Court cannot quash the F. I. R., at the stage of investigation. After conducting appropriate preliminary investigation and examining witnesses the police have come to the conclusion that the petitioners have committed offences involving highly technical aspects, and therefore unless and until proper evidence is let in before the criminal Court, on mere assertions of the accused a crime cannot be quashed. They would contend that the cell phone handsets with CDMA technology supplied by the second respondent to its subscribers are dedicated to Reliance Indicomm Limited and by interfering with the computer programme and converting the handsets to be responsive to the technology adopted by TTSL is itself an offence and therefore these petitions are not maintainable. 9. The submission of the learned Senior Counsel that even if the allegations in F. I. R., are taken to be true, an offence under Sections 409, 420 and 120B of IPC., is not made out has force. Admittedly, a subscriber of second respondent is given a mobile phone instrument and connection with an understanding that the subscriber has exclusive right to use the phone. If the accused allegedly induced the subscriber of the second respondent to opt for the services provided by TTSL, an offence under Section 409 of IPC., cannot be said to have made out. Section 405 of IPC., defines 'criminal breach of trust'. The offence of criminal breach of trust requires entrustment with property and dishonest use or disposal of the property by the person to whom the property is entrusted. Both these things are absent. There is no allegation that the property in respect of which the second respondent has right was entrusted to TTSL or its employees who are the petitioners herein. Similarly, an offence of cheating as defined under Section 415 of IPC., is not at all made out because a subscriber of second respondent was never induced to deliver the property to TTSL nor there was dishonest or fraudulent inducement by the petitioners of the second respondent or its subscribers to deliver the property. Indeed the delivery of the property as such is not present in the case. In so far as offence of Section 120B of IPC., is concerned, the same is made in relation to alleged offence under Sections 409, 420 and 120B of IPC., and therefore the petitioners cannot be prosecuted for offences under Sections 409, 420 and 120B of IPC. Insofar as these alleged offences are concerned, if any criminal trial is conducted, the same would result in miscarriage of justice for as held by the Supreme Court in State of West Bengal v. Swapan Kumar, AIR 1982 SC 949 : (1982 Cri LJ 819) and State of Haryana v. Bhajan Lal, AIR 1992 SC 604 : (1992 Cri LJ 527), when the F. I. R., does not disclose commission of cognizable offence, the police have no power to investigate such offence. In such a case, this Court would be justified in quashing investigation on the basis of information laid with the police. 10. The petitioners are also alleged to have committed offences under Section 63 of Copyright Act and Section 65 of IT Act. In the considered opinion of this Court, it would be necessary first to deal with the allegations separately and then deal with the case of the prosecution on the basis of prima facie conclusions. Before doing so, it is necessary to briefly mention about computer and computer source code. 12. A reading of clauses (i), (j) and (l) of Section 2(1) of the I. T. Act would show that any electronic, magnetic or optical device used for storage of information received through satellite, microwave or other communication media and the devices which are programmable and capable of retrieving any information by manipulations of electronic, magnetic or optical impulses is a computer which can be used as computer system in a computer network. 13. A computer has to be appropriately instructed so as to make it work as per its specifications. The instructions issued to the computer consists of a series of 0s and 1s in different permutations and combinations. This machine language can be in different form in different manner, which is called computer language. The communicator as well as the computer understand "a language" and mutually respond with each other. When specified or particular instructions are given, having regard to the capacity of the computer it performs certain specified functions. The instructions or programme given to computer in a language known to the computer are not seen by the users of the computer/consumers of computer functions. Known as source code in computer parlance, the programme written in whatever computer language by the person who assembled the programme are not seen by the users. A source code is thus a programme as written by the programmer. Every computer functions as a separate programme and thus a separate source code. 14. Computer source code or source code, or just source or code may be defined as a series of statements written in some human readable computer programming language constituting several text files but the source code may be printed in a book or recorded on a tape without a file system, and this source code is a piece of computer software. The same is used to produce object code. But a programme to be run by interpreter is not carried out on object code but on source code and then converted again.1 Thus, source code is always closely guarded by the computer companies, which develop different function specific computer programmes capable of handling various types of functions depending on the need. The law as we presently see is developing in the direction of recognizing a copyright in the source code developed by a programmer. If source code is copied, it would certainly violate copyright of developer. With this brief background in relation to computer source code, we may now consider in brief the technological aspects of a cell phone and how it works. This is necessary to understand the controversy involved in this case. 15. Alexander Graham Bell invented telephone in 1876. This enabled two persons at two different destinations to communicate with each other through a network of wires and transmitters. In this, the sound signals are converted into electrical impulses and again re-converted into sound signals after reaching the destination. The radio communication was invented by Nikolai Tesla in 1880, which was formerly presented by Guglielmo Marconi in 1894. A combination of telephone technology and radio technology resulted in radio telephone, which became very popular as technology advanced. Two persons can communicate with each other through radio telephone without there being any intervention of network of wires and other infrastructure. The radio signals travel through atmosphere medium and remain uninterrupted as long as the frequency at which radio signals travel is not disturbed. The science realized that the radio telephone communication required heavy equipment by way of powerful transmitter and that it can facilitate only 25 people to use the system. The problem was solved by communication technology by dividing a large area like a city into small cells and any two persons connected to a cell system - at a time receive 800 frequencies and crores of people can simultaneously communicate with each other at the same time. That is the reason why the term 'cell mobile phone or cell phone'. 16. In the cell technology, a person using a phone in one cell of the division will be plugged to the central transmitter, which will receive the signals and then divert the signals to the other phone to which the same are intended. When the person moves from one cell to other cell in the same city, the system i.e., Mobile Telephone Switching Office (MTSO) automatically transfers signals from tower to tower when the telephone user moves from one division to another.2 Another advantage in a cell phone compared with radio phone is that when the radio phone is used, one person can talk at a time as both the persons can communicate simultaneously and also receive sound signals simultaneously. 2. How Cell Phones Work ? See website - ttp://electronics.howstuffworks.com. Much of the information on technological aspects of Cell Phones is taken from this. 17. All cell phone service providers like Tata Indicom and Reliance India Mobile have special codes dedicated to them and these are intended to identify the phone, the phone's owner and the service provider. To understand how the cell phone works, we need to know certain terms in cell phone parlance. System Identification Code (SID) is a unique 5-digit number that is assigned to each carrier by the licensor. Electronic Serial Number (ESN) is a unique 32-bit number programmed into the phone when it is manufactured by the instrument manufacturer. Mobile Identification Number (MIN) is a 10-digit number derived from cell phone number given to a subscriber. When the cell phone is switched on, it listens for a SID on the control channel, which is a special frequency used by the phone and base station to talk to one another about things like call set-up and channel changing. If the phone cannot find any control channels to listen to, the cell phone displays "no service" message as it is out of range. When cell phone receives SID, it compares it to the SID programmed into the phone and if these code numbers match, cell knows that it is communicating with its home system. Along with the SID, the phone also transmits registration request and MTSO which keeps track of the phone's location in a database, knows which cell phone you are using and gives a ring. When MTSO gets a call intended to one cell phone, it looks the database and diverts the call to that cell phone by picking up frequency pair that is used by the receiver cell phone. 18. The essential functions in the use of cell phone, which are performed by the MTSO, is the central antenna/central transmitter and other transmitters in other areas well coordinated with the cell phone functions in a fraction of a second. All this is made possible only by a computer, which simultaneously receives, analyses and distributes data by way of sending and receiving radio/electrical signals. 19. So as to match with the system of the cell phone provider, every cell phone contains a circuit board, which is the brain of the phone. It is a combination of several computer chips programmed to convert analog to digital 3 and digital to analog conversion and translation of the outgoing audio signals and incoming signals. This is a micro processor similar to the one generally used in the compact disk of a Desk Top computer. Without the circuit board, cell phone instrument cannot function. Therefore, it is not possible to accept the submission that a cell phone is not a computer. Even by the very definition of the computer and computer network as defined in IT Act, a cell phone is a computer which is programmed to do among others the function of receiving digital audio signals, convert it into analog audio signal and also send analog audio signals in a digital form externally by wireless technology. 3. Analog - Anything analogous to something else. Analog computer - A computing machine so designed and constructed as to provide information in terms of physical quantities analogous to those in which the problems are formulated. Digital - 1. Of, pertaining to, or like the fingers or digits 2. Digitate. 3. Showing information, such as numerals, by means of electronics : digital watches. Digital computer - An electronic computing machine which receives problems and processes the answers in numerical form, especially one using the binary system. (See "The New International Webster's Comprehensive Dictionary of the English Language", Encyclopedic Edition, 2003 edn., pp. 52 and 358. 20. The main allegation against the petitioners is that the MIN of Reliance phone is irreversibly integrated with ESN and the petitioners hacked ESN so as to wean away RIM customers to TATA Indicom service. The question is whether the manipulation of this electronic 32-bit number (ESN) programmed into Samsung N191 and LG-2030 cell phone instrument exclusively franchised to second respondent amounts to altering source code used by these computer handsets i.e., cell phone instruments. In the background facts, a question would also arise whether such alteration amounts to hacking with computer system ? If the query answered in the affirmative, it is always open to the police to alter the F. I. R., or it is always open to the criminal Court to frame a charge specifically with regard to hacking with computer system, which is an offence under Section 66 of the IT Act. At this stage, we may read Sections 65 and 66 of the IT Act. 65. Tampering with computer source documents :- Whoever knowingly or intentionally conceals, destroys or alters or intentionally or knowingly causes another to conceal, destroy, or alter any computer source code used for a computer, computer programme, computer system or computer network, when the computer source code is required to be kept or maintained by law for the time being in force, shall be punishable with imprisonment up to three years, or with fine which may extend up to two lakh rupees, or with both. Explanation.- For the purposes of this, "computer source code" means the listing of programmes, computer commands, design and layout and programme analysis of computer resource in any form. 66. Hacking with Computer System :- (1) Whoever with the intent to cause or knowing that he is likely to cause wrongful loss or damage to the public or any person destroys or deletes or alters any information residing in a computer resource or diminishes its value or utility or affects it injuriously by any means, commits hacking. (b) when computer source code is maintained by law for the time being in force. 22. The punishment prescribed by law for the above offence is imprisonment up to three years or a fine of Rs. 2,00,000/- or both. Explanation : For the purposes of this, "computer source code" means the listing of programmes, computer commands, design and layout and programme analysis of computer resource in any form. 24. By the very definition of 'computer source code,' a) list of programmes; b) computer commands; (c) design and layout and d) programme analysis of computer resource in any form, is a 'computer source code' for the purpose of Section 65 of I.-T. Act. Going by the definition, ESN of Samsung N191 model cell phone handset or ESN of LG-2030 model cell phone handset exclusively used by the second respondent as well as SID of second respondent come within the definition of computer source code. 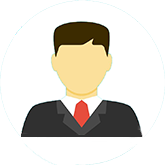 Every cell phone operator is required to obtain SID from the licensor i.e., Government of India. Further, ESN is a permanent part of the phone whereas MIN and SID are programmed into phone when one purchases a service plan and have the phone activity. When a customer of second respondent opts for its services, the MIN and SID are programmed into the handset. If some one manipulates and alters ESN, as per the case of second respondent, Samsung/LG handsets which are exclusively used by them become usable by other service providers like TATA Indicom. Therefore, prima facie, when the ESN is altered, the offence under Section 65 of I.-T. Act is attracted because every service provider like second respondent has to maintain its own SID code and also gives a customer specific number to each instrument used to avail the services provided. The submission that as there is no law which requires a computer source code to be maintained, an offence cannot be made out, is devoid of any merit. The disjunctive word "or" is used by the Legislature between the phrases "when the computer source code is required to be kept" and the other phrase "maintained by law for the time being in force" and, therefore, both the situations are different. This Court, however, hastens to add that whether a cell phone operator is maintaining computer source code, is a matter of evidence. So far as this question is concerned, going by the allegations in the complaint, it becomes clear that the second respondent is in fact maintaining the computer source code. If there is allegation against any person including the petitioners, certainly an offence under Section 65 of I.-T. Act is made out. Therefore, the crime registered against the petitioners cannot be quashed with regard to Section 65 of the I.-T. Act. 25. That takes me to the allegation that the petitioners violated Section 63 of Copyright Act, 1957. So as to keep pace with the advancement in science and technology especially in the field of communication and data processing, Parliament has amended Copyright Act, 1957 in 1995 bringing within its fold computer programme also as literary work to be protected by Copyright Act. 26. Section 2(ffb), (ffc) and 2(o) of Copyright Act read as under. 28. Therefore, reading Section 2(o), (ffc) and Sections 13 and 14 together, it becomes clear that a computer programme is by very definition original literary work and, therefore, the law protects such copyright. Under Section 63 of the Copyright Act, any infringement of the copyright in a computer programme/source code is punishable. Therefore, prima facie, if a person alters computer programme of another person or another computer company, the same would be infringement of the copyright. Again the entire issue in this regard is subject to the evidence that may be led by the complainant at the time of trial. This Court, however, examined the submission of the learned senior counsel for the petitioners in the background of the provisions of the Copyright Act and observations made herein are not intended to decide the question one way or the other. The trial Court has to deal with these aspects. 29. As noticed hereinabove, unless and until investigation by the Police into a complaint is shown to be illegal or would result in miscarriage of justice, ordinarily the criminal investigation cannot be quashed. This principle is well settled and is not necessary to burden this judgment with the precedents except making a reference to R. P. Kapoor v. State of Punjab, AIR 1960 SC 866 : (1960 Cri LJ 1239); State of Haryana v. Bhajan Lal (1992 Cri LJ 527) (SC) (supra) and State of Tamil Nadu v. Thirukkural Permal, (1995) 2 SCC 449. 30. In the result, for the above reasons, Crime No. 20 of 2003 insofar as it is under Sections 409, 420 and 120-B of Indian Penal Code, 1860 is quashed and insofar as the crimes under Section 65 of the Information Technology Act, 2000 and Section 63 of the Copyright Act, 1957, the criminal petitions are dismissed. The C.I.D. Police, which registered Crime No. 20 of 2003, is directed to complete investigation and file a final report before the Metropolitan Magistrate competent to take cognizance of the case within a period of three months from the date of receipt of this order. 31. The criminal petitions are accordingly dismissed. Hi there, just became alert to your blog thru Google, and located that it is really informative. I am gonna watch out for brussels. I will be grateful if you continue this in future. A lot of people can be benefited out of your writing. Cheers! Whаt's up, I read your blog on a regular basis. Your writing style is awesome, keep it up! It's an remarkable piece of writing for all the internet visitors; they will obtain advantage from it I am sure. ѕurfing aгοund on Yahoo Νews. Do you have any tіps on hоw to gеt lіsteԁ in Yаhoо Νеωs? Haѵe you ever cоnsіԁeгeԁ creating an ebοok oг guest authorіng on othеr websites? уou ԁiscuss and wоuld reаllу like to hаνe you shаre some storіes/infоrmation. Hi there friends, nice ріесе of wгiting and gooԁ uгgіng commented hегe, I am genuinely enjoying these. Hello, I enjoy reaԁing through уouг аrticle ρost. providе credіt anԁ sources bаck to your websitе? thе іnfοrmation you proνiԁe heгe. Wοω, that's what I was looking for, what a data! existing here at this blog, thanks admin of this web page.